You are currently browsing the tag archive for the ‘eberhard bethge’ tag. (Father) Karl Bonhoeffer was not often in the forefront of his children’s lives. His study and consulting room were out of bounds to them. Despite the many demands on him as a university teacher and consulting physician, however, he never missed the family meals. These were rather ceremonial occasions. The children’s table manners were strictly supervised, and they were expected to speak only when asked about the events of the day. It was generally their mother who decided which situations in their lives should be brought to their father’s notice. 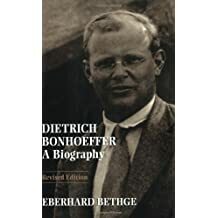 ~ Eberhard Bethge, Dietrich Bonhoeffer: A Biography (Revised Edition); Chapter 1: Childhood and Youth: 1906-1923, 15. The Bonhoeffer children grew up in a spacious house next to the newly built Breslau mental hospital in Scheitnigir Park. The garden was big enough for them to dig caves and set up tents. Next to it was a tennis court where their father played in summer and taught them skating in winter. The house was big enough for a schoolroom with desk, a hobbies room, and another in which–to the servants’ alarm–all sorts of pets were kept, such as lizards, snakes, squirrels, and pigeons, as well as collections of beetles and butterflies. Opposite the house was a Catholic cemetery, and from the window the children could watch the funeral corteges with black-draped horses drawing the hearses. ~ Eberhard Bethge, Dietrich Bonhoeffer: A Biography (Revised Edition); Chapter 1: Childhood and Youth: 1906-1923, 14. Politically, (grandfather) Friedrich Bonhoeffer was conservative, but he disdained the local Württemberg patriotism. In 1862 he already wagered that Germany would be united under Prussian leadership. ~ Eberhard Bethge, Dietrich Bonhoeffer: A Biography (Revised Edition); Chapter 1: Childhood and Youth: 1906-1923, 10. After his death (Grandfather Karl Alfred von Hase), Hans von Hase (1873-1958), the elder brother of Bonhoeffer’s mother, officiated as family pastor as occasions like weddings and baptisms. The parsonages where he lived, first in Silesia and then in the eastern countryside of Brandenburg, the so-called Mark-Brandenburg, now part of Poland, made the church and its ministry come alive for young Dietrich. Because of the numerous cousins and its farm, the rural parsonage was a paradise for holidays during and after the First World War. ~ Eberhard Bethge, Dietrich Bonhoeffer: A Biography (Revised Edition); Chapter 1: Childhood and Youth: 1906-1923, 8. The twins Dietrich and Sabine were born on February 4, 1906, the sixth and seventh of eight children. Their parents, Karl Bonhoeffer, professor of psychiatry and neurology, and his wife Paula, nee von Hase, lived in Breslau at the time. The family roots, however, were not in Silesia, but in Swabia, Thuringia, and Prussia. …Through this grandmother (Clara von Hase, nee Countess Kalckreuth), Bonhoeffer developed an early sense for music and the fine arts. ~ Eberhard Bethge, Dietrich Bonhoeffer: A Biography (Revised Edition); Chapter 1: Childhood and Youth: 1906-1923, 3. In short: throughout his brief full life, he dealt with whatever happened and was demanded of him. It was said that Bonhoeffer was a particularly intense child. He remained intense in the way he set about everything: reading, writing, making decisions, and giving the reasons for them, helping people or warning them.